Robert Sestok surveys the collection of his work he's installed on a vacant lot off of the Lodge. A tall man in most circles, Cass Corridor artist Robert Sestok is dwarfed next to his own artwork. His hulking metal sculptures are welded from urban scrap and transformed into undulating towers of shapes. More than a dozen of Sestok's works rise over the Lodge Freeway, on a previously vacant lot on Alexandrine Street in Detroit. 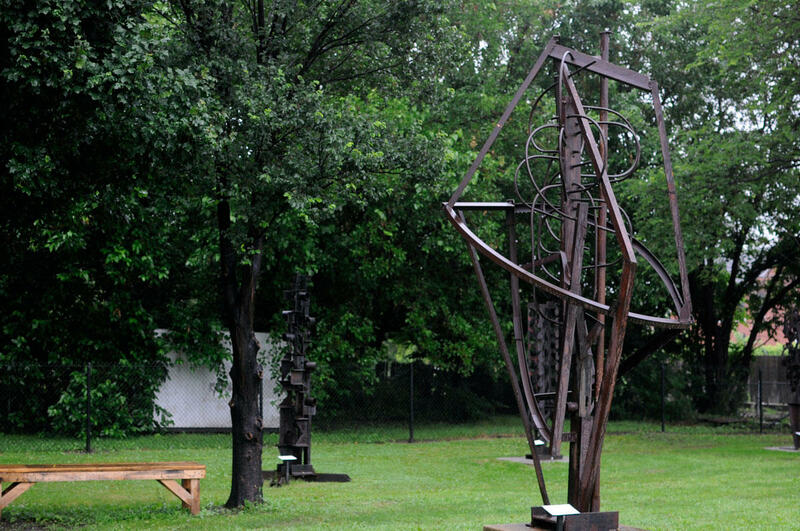 It's now called the "City Sculpture Park" and opens to the public on Friday. 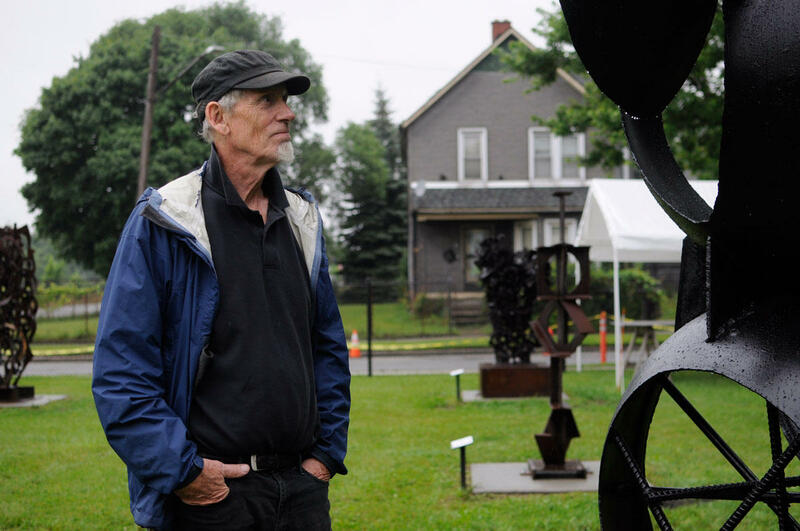 Sestok installed work that spans 35 years, starting with a piece he made right out of art school in 1980. 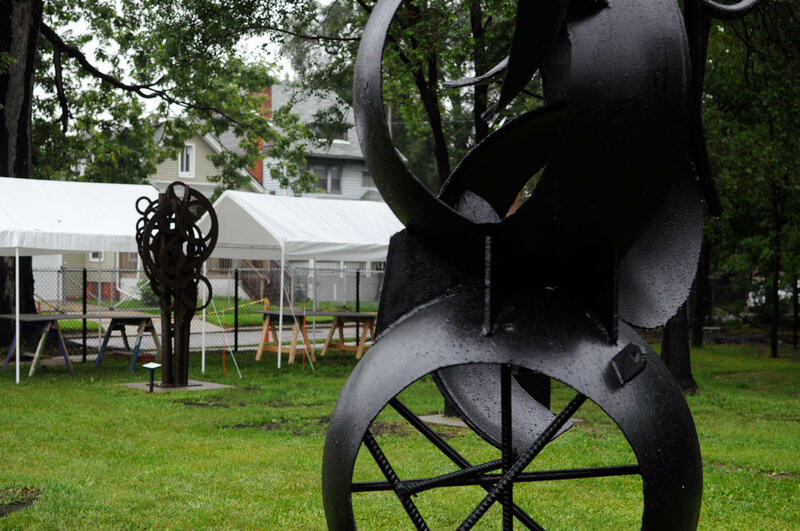 A sculpture in "City Sculpture Park," a public art project of Robert Sestok's opening July 10. Sestok found the property through a neighbor of his, who had been taking care of it – keeping the grass cut and trash picked up. When his neighbor passed away, Sestok took over the duties, and eventually thought that the noise-pollution-soaked spot would make a fitting location to display the giant sculptures crowding his studio space just down the block. "You gotta remember cars are made of metal," he explained. "There's a lot of metal that drives by all day long. Tons and tons of steel going down the freeway and here is tons of steel sitting by the freeway." He says it's "mystifying" to see so much of his work collected in one place. Sestok says he is experimenting with welding techniques as he moves forward in his career. As of now, Sestok plans to leave the park open to the public, to be discovered and stumbled upon.